The Sandbox Savant: Gold's three "M's"
I’m still amazed by how little people understand of gold. It is clearly a massive indication on just how effective the government propaganda machines have been in the era of worthless, backed-by-nothing paper. But gold is now starting to stand up and speak for itself. Gold prices expressed in paper currency terms will keep rising, occasionally suffering sell-offs, but marching steadily higher nonetheless. Can we reach $10,000/oz? Yes. Can we go even higher than that? You bet. Voltaire said in the late 18th Century that all paper currency eventually tends to its intrinsic value, zero, and when the US dollar’s debt metrics finally topple over, the 80-year experiment with un-backed pieces of paper will come to an end. To fully understand gold and why its price expressed in paper currencies must keep rising, you need to know gold’s three “M’s”: Money, Manipulation, and Misunderstanding. Gold is money and money is gold. That’s the first M you need to get because it really is everything – the beginning and end of any discussion on gold. The other two M’s follow from this fact. Not only is gold real money, but all other forms of money used in history have been a distant second. Fiat paper currency is at best a money substitute, but nowhere close to real money. Why is real money gold, and not stones, seashells, cattle or paper notes? Gold (and silver) has been proven by history and thousands of years of trial and many errors to be the best substance to fulfill the role of a medium of exchange, store of value, and unit of account. People have tried to use cattle, but it was not divisible, and neither was it uniform, durable, or portable enough to withstand the rigorous demands of the market for money. They’ve tried seashells, until someone figured out that a trip to the beach was lucrative and destroyed its value. Governments tried to mint less precious metal such as copper or other alloys, but could never ensure enough scarcity of supply to maintain value, rid the system of forgery, or concentrate enough value in the coins to make the money conveniently portable. Governments have tried paper, but it was too easy to print out of thin air and countless regimes from the Weimar Republic to Mugabe’s Zimbabwe have utterly destroyed paper’s value. Throughout this process of men, leaders, empires and governments ignoring gold as real money, vast wealth has been destroyed, transferred or confiscated unjustly, particularly as the state has tried to foist its chosen form of money on the people. Time and again, year in year out, century in century out, millennium in millennium out, the people choose gold as money. From Roosevelt in the 1930’s to Nixon’s supposed final nail in gold’s coffin in 1971, the state quickly took total control of money, fully unhinging it from any solid backing, and embarked on total manipulation of gold. The market’s verdict was swift, and by the end of the ‘70’s the gold price expressed in US dollars and other currencies was exponentially higher than the $35/oz in 1970. By 1980 the situation had become untenable. The only way for governments to ‘prove’ that their money was good enough was to raise interest rates in a Draconian fashion (US interest rates jumped to 20% under Regan/Volker), making the opportunity cost of holding gold prohibitive to doing so, and selling or leasing their vault gold into the market. The period 1981 to 2001 was such a time of manipulation as governments tried to restore the perception of paper currency, and diminish the perception of gold. Since 2001 gold has broken out of its manipulative shackles, and now central Banks have far less gold in their vaults while individual gold ownership is climbing. The scope for manipulation is fading, but people have to understand that governments will always try to manipulate, control, and monopolise gold because it is real money. Lack of knowledge and understanding of the first two “M’s” is why gold remains the most misunderstood good. Financial analysts, investors, fund managers, shop keepers and paupers all have a similar understanding of gold – next to nothing. If they claim to understand the metal, it’s usually a misunderstanding. Most people I engage with on the subject usually dismiss gold as a barbarous relic, think buyers of gold are silly, and think the current bull market is driven simply by sentiment. Gold’s current bull run is no less than the market’s fundamental verdict on failing paper currency. It is mankind’s perpetual and ancient vote for real money. It is the ever-approaching triumph of market over state. It is a quest for sound exchange and a just, accurate store of value. That so few people realise this still means that the gold price expressed in paper currency has a lot further to climb. Excellent, to the point, article! The beauty of any money, paper or gold, is that it is purely based on people's "faith" in it. I.e. it's not much different from religion. There is no doubt that gold is better than paper money, but it is still a raw metal that doesn't have much of a purpose in itself. Unfortunately, if you do use something with "purpose", you might find that it can break/degrade and therefore lose its value. Personally, I hope we're headed for a Star Trek style economy. Nanotech ovens with a probe in the air and a probe in the rubbish dump synthesize everything we can possibly desire. Of course, there'll be "Open Source" goods and "Branded" goods for which you'd still have to pay. But copyright is going to take on a WHOLE new meaning when people start pirating the formula for a Lamborghini Murcielago and have a Roomba ver 5 assemble it in the garage from materials molecularly assembled from your sewerage pipe. 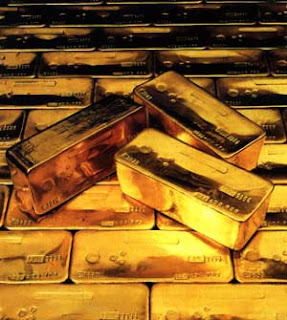 Is money not a number representing the agregate value of things that we value, including gold? Is market forces not a determinant of that number that we call money? For instance, does market forces not allocate numbers, representing the value that we allocate to each good or service? Why then would you want to fix the numbers (money) that we allocate to goods in order to express the value that we allocate to them, to gold? No, money is only a medium of exchange. it signifies trust. If definitely doesnt present a *value* in what we value - although one would think so. The simple reason: money can be created literally out of thin air and with wild exchange rate fluctuations vary widely from day to day. it merely presents a vote on what we value. it is a subtle point, but one I think is important. third point: I am not convinced we do want to fix the value of goods and services against gold. that is just one theory (albeit one held by many smart people). The view is that if we do this, we take inflation out of the monetary equation, which is a powerful idea. right now, most central banks target inflation.